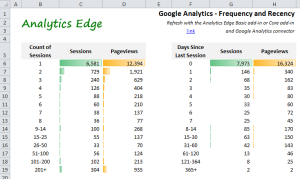 This free Excel report includes all the formulas and conditional formatting needed to reproduce the Google Analytics Frequency and Recency reports. Use it as part of your dashboard project! A quick refresh and your website data is presented in an easy-to-understand tabular format, complete with background bar chart-like conditional formatting providing a quick visual reinforcement of the larger numbers. This entry was posted in A. E. Basic Add-in, A. E. Core Add-in, A. E. Standard Add-in, Google Analytics on 2016/01/02 by free reports. 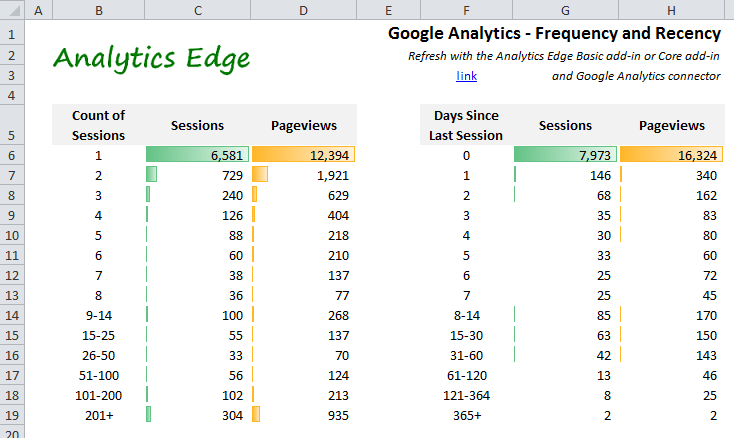 Google Analytics: WTF is Happening to My Traffic?
! Assistance with Custom Reporting !